sanwa millet recipes | Indian sama recipes, barnyard millet. Millets are wonder food with a protein structure similar to wheat, but they are gluten free, making them nutritionally superior. They are a rich source of starch, making it a high-energy food and also an excellent source of protein and fiber. They are mostly pest-free and low fertilizer used in growth and widely available in organic form. Store them in an air-tight container in a cool, dry and dark place. Sanwa millet (Barnyard millet) are tiny, white, round grains. They can be cooked like rice, hence they form a great substitute during fasting. In many parts of the world, barnyard millet has traditionally been used in food products and various food items like unleavened bread, cookies and cakes. Sanwa millet or sama is great option to use for breakfast in India. Given below are some super recipes to try. Lots of Indians fast on Tuesdays and Thursday and cook dishes using sama as they don't eat grains like wheat, dals and rice on those days. Sanwa Panki: Panki is an authentic Gujarati dish made by cooking batter between banana leaves. While pankis made with rice flour batter are the most common, we have made a fasting variant using Sanwa millet. Faarali Idli Sambhar: A faraali version of your fluffy rice cake is all you need during your next Faraal. The accompanied sambhar is also a healthy variant made using vegetable puree. Sanwa Dosa: Sanwa dosa is a thin, crispy and tasty variant of dosa that can be savored during fasting days. Sweet Faraali Pancakes: Make these delicious, coconut flavored pancakes. Theses pancakes are soft, light and just with a hint of sweetness. Here are some sama recipes which you can enjoy on your fasting days and festivals like Navratri, Maha Shivratri and Janmashtami. Sama Pulao: Rice being a staple food of India, it is almost consumed in one meal of the day. Missing rice during your fasts? Try making this Pulao and enjoy it with Rajgira Kadhi! Minty Sanwa: Indulge in a wholesome meal of minty sanwa sama made with a unique combination of coconut milk and sanwa millet. Samo Khichdi: A quick and easy meal that can be prepared within 10 minutes, try this millet based khichdi during your next fast! Sanwa Millet (Sama, Barnyard Millets) : Like most millets, sanwa millet is also high in protein. Moreover, sanwa millet has the least calories and carbs as compared to other millets like jowar, bajra, ragi. With a good amount of fiber, phosphorus and magnesium, there is no reason for heart patients to avoid this millet. It will keep a check on your cholesterol levels and blood pressure both. Small amount of same should be had by diabetics. See detailed benefits of sanwa millet. 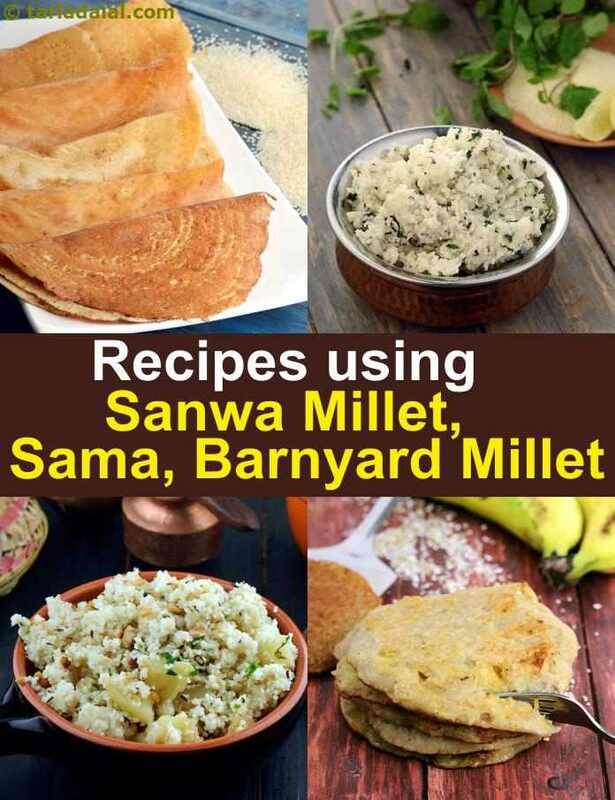 Enjoy our sanwa millet recipes | Indian sama recipes, barnyard millet below. A delicious sev puri which consists of sanwa, potato, curd, cucumber etc. If u feel the fried peanuts are too high calorie, u can even replace it by garnishing the khichdi with coarsely grounded, roasted peanuts. Healthy snack and quick faraali item. Samo kadhi is a mouthwatering kadhi recipe with boiled samo cooked with beaten curd and then tempered with mustard seeds, hing and green chillies. Relish the samo kadhi with steamed rice. May be served with buttermilk. An interesting, crisp and healthy pancake or dosa recipe, the Morio Sabudana pan cake has Sabudana, morio, chillies, salt and curd as ingredient. Relish the pancakes as breakfast with fresh coconut scrapings as filling and chutney as accompaniment. The faraali dahi wade are just so yummy and so easy to prepare. You can make them in just abt 20-25 mins. If you have guest coming home you can just prepare them well before and fry them just 10 mins before serving or you can fry them and keep it before. You must try it. A cake which could be eaten as a strawberry fariyali cake!!!!!! Just like sago ,sanwa millet also can eat on fast day.I like sanwa khichadi also .